Annaelle was born and bred in Mauritius. She moved to Cape Town in 2002 to pursue her studies in English, communication and later Education. This fiery woman has a strong passion and interest in dancing and teaching. She follows in the close footsteps of her grandparents who were also teachers. From very little Annaelle played the teacher as a game with her neighbours. Then when she was in secondary school, she tutored and assisted disadvantaged children of her community with their homework and so her love for imparting knowledge to others and sharing ideas was born. 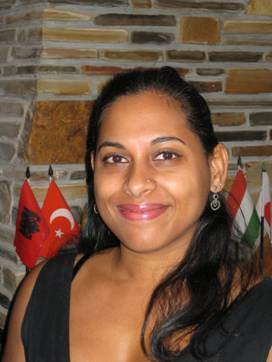 Annaelle has been working for Cape Studies since 2007. She was initially employed as an English teacher and was promoted to Director of Studies a year and a half later. Even though, she doesn’t find herself teaching in a classroom regularly, she is actively involved in every step that makes learning at Cape Studies fun and effortless. Annaelle plays an integral role in the administration of courses, exams and students. She prides herself on her high quality work, efficiency and reliability. She believes that teaching is all about dedication and passion and this should be felt when sitting in a class. She works closely with her team of teachers in a relaxed and fun environment where trust and communication are key factors. What she likes most about Cape Studies is its stress-free atmosphere and their one big family policy.